In temperate climates, this is the time of year when corn, watermelon, and Ferris wheels proliferate. The latter can be found at parking-lot carnivals and county fairs almost everywhere during the warmer months. In addition to being distinctive symbols of these events, Ferris wheels provide seasonal employment for fellows whose tattoos outnumber their teeth. There are also permanent, more sophisticated versions that are tourist attractions in places like Vienna and London. Singapore has a Ferris wheel that is currently the world’s tallest (541 feet), but Beijing has one under construction that, when completed, will top that. The original was 264 feet high; it was designed and built for a world exposition held in Chicago in 1893. You probably won’t be shocked that the name of the man who designed it was Ferris. George Washington Gale Ferris, Jr. had been an engineer specializing in bridge-building and other large-scale projects. When the organizers of the World’s Columbian Exposition challenged American architects and engineers to come up with a landmark that would rival the Eiffel Tower (which had been built for the Paris Expo in 1889), Mr. Ferris presented his plan for what he called an “observation wheel”. The organizers considered him a crackpot at first, but when he came back with $400,000 from local investors to pay for construction, the committee reconsidered and gave him the go-ahead. George Ferris had to solve a number of problems during construction, not least of which was how to pour concrete pilings in sub-zero January temperatures. 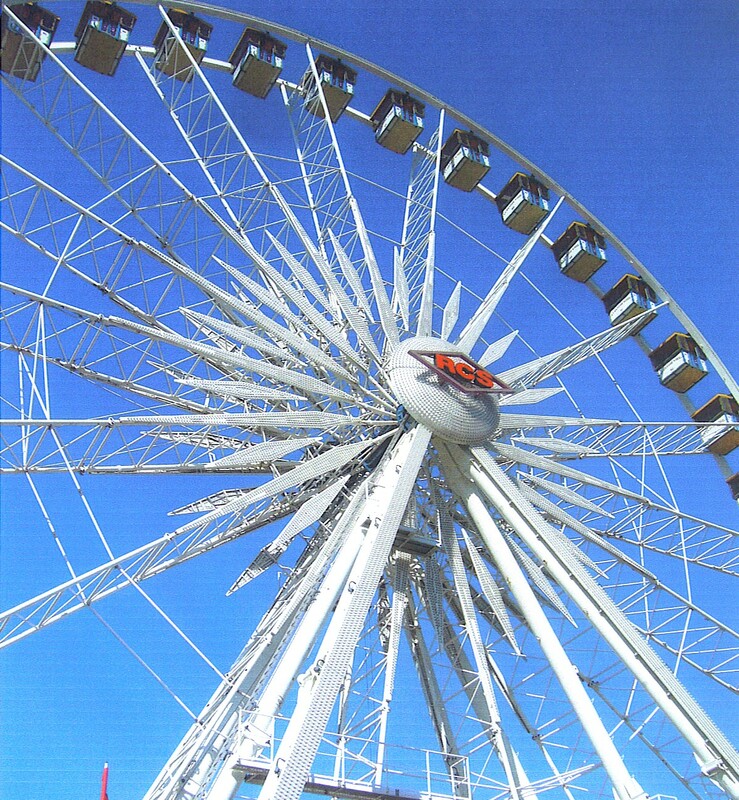 The wheel wasn’t ready when the Exposition opened, but it began operating a few weeks later and was a huge success. In 19 weeks it carried an estimated 1.5 million visitors, even though a single ticket was, for the average guy, a sizable chunk of his paycheck — 50 cents. A ride on the original Ferris wheel lasted about twenty minutes, and made two revolutions: the first stopped six times for loading and unloading, and the second was one nine-minute nonstop loop. On one occasion, George gave a dramatic demonstration of the Ferris wheel’s safety by taking his wife and a reporter for a ride on it during a storm with 100+ mile-per-hour winds. They came through it without incident — although Mrs. Ferris left George soon thereafter. When the World’s Columbian Exposition concluded, the Ferris wheel had generated something like $750,000 in revenue, but the organizers seem to have used it to cover other expenses. George Ferris spent the next couple of years in court, unsuccessfully trying to get his (and his investors) share of the profits. The original Ferris wheel eventually sold at a bankruptcy auction for $8,150 and was carted off to the 1904 St. Louis World’s Fair. George had died broke and alone in 1896, but he did get his name forever associated with the “observation wheel”. Incidentally, George Ferris was not the only member of his family who made a contribution to our enjoyment of carnivals. He had an uncle, Nathan Ferris, who was a popcorn pioneer — he even popped up a batch for Queen Victoria in 1846. In his honor, perhaps we should call the colossal bags of carnival kettle corn “Nathans”.